It was no laughing matter when a passenger's alleged joke lead to an Ebola scare on-board a US Airways flight from Philadelphia. PHILADELPHIA (WPVI) -- A U.S. man's apparent joke about having Ebola on a flight out of Philadelphia quickly brought an end to his trip to the Dominican Republic. Officials in the country say the man was checked into the infirmary of the airport in the resort city of Punta Cana. After it was determined the passenger didn't have Ebola, he was put on a plane and sent back to the United States. It wasn't clear if he was coming back to Philadelphia. Airport Operations Director Walter Zemialkowski declined Friday to release the name of the passenger from the US Airways flight. Grupo Punta Cana Vice President Paola Rainieri said in a radio interview that the man claimed to have Ebola in what was apparently a "joke in bad taste." For nearly two hours US Airways Flight 845 was held in isolation on the tarmac after it landed in Punta Cana on Wednesday. According to the airline, a male passenger on-board sneezed then said he had Ebola, which resulted in a chain reaction. A flight attendant informed the captain and the captain alerted health officials. The incident was captured on video as many passengers had their cell phone cameras rolling. 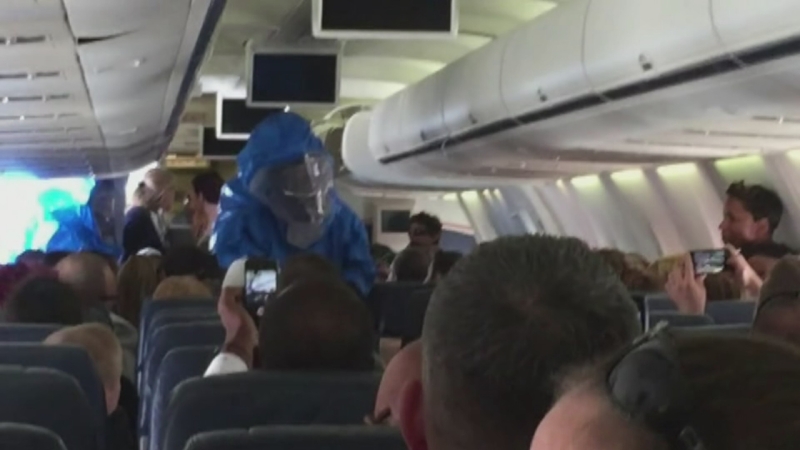 Cellphone cameras were rolling as crews in hazmat suits boarded a US Airways flight from Philadelphia to the Dominican Republic after a passenger's alleged joke prompted an Ebola scare. "I need your attention. It's going to look worse than it really is," said the flight attendant in the video. The attendant can be heard warning passengers that health experts would be coming on-board in special suits. Soon after, four workers in blue hazmat suits and protective masks walked onto the plane. The crew tracks down the passenger who made the alleged comment. As the passenger in question was being interviewed, he can be heard saying, "Man I was just kidding." However it was no laughing matter, as the CDC has issued strict guidelines for US airliners in regards to Ebola. The passenger cooperated and was finally escorted off the plane. US Airways apologized for the inconvenience but says the safety of its customers and employees is priority. US Airways flight 845 from Philadelphia to Punta Cana was met yesterday by local officials upon landing due to a possible health issue on board. We are following the direction of, and strictly adhering to, all Centers for Disease Control and Prevention (CDC) guidelines in place for airlines in response to the Ebola virus. The flight was checked by officials and cleared. We apologize for any inconvenience this may have caused but the safety of our customers and employees is our first priority.